Pinto beans are one of the very first things I ever learned to cook in the crockpot- my mother made them pretty regularly when I was a child. Generally she would make them on a Sunday and serve them with roast or a beefy dish. 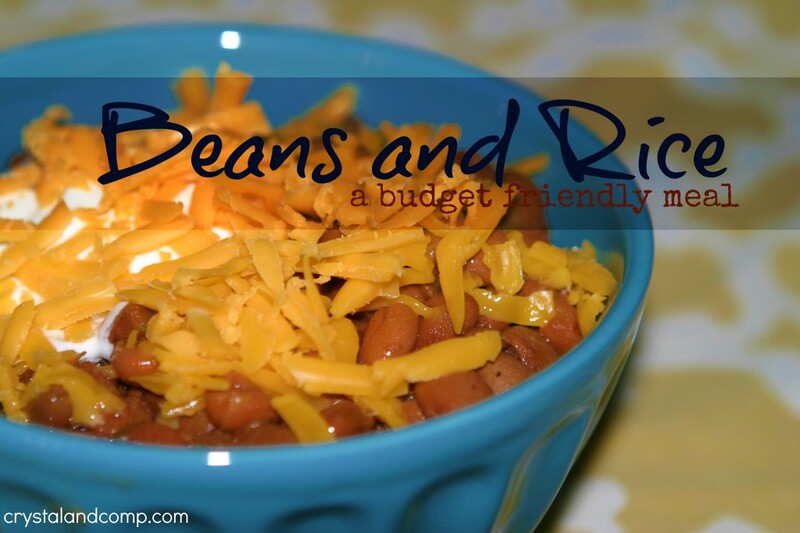 Beans are very inexpensive, very filling and one batch is plentiful. They certainly fall into the easy recipes category. 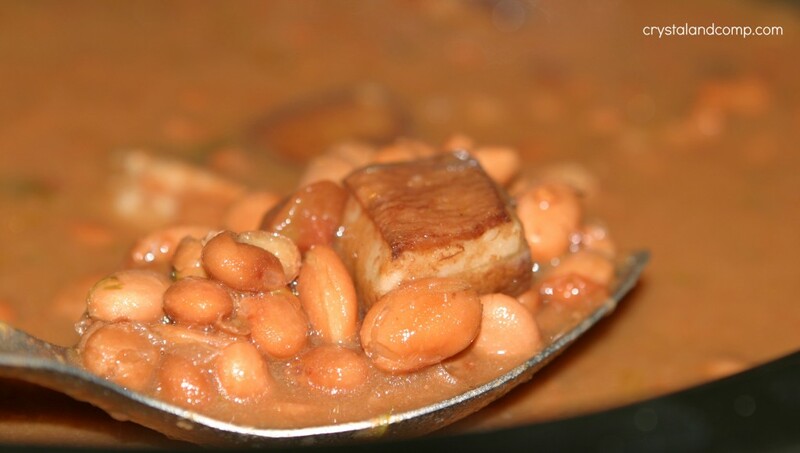 There was a time in my life where I made beans in the crockpot every week- because that is all we could afford. This recipe will make plenty and should give you some leftovers that you can freeze and use for a later recipe. 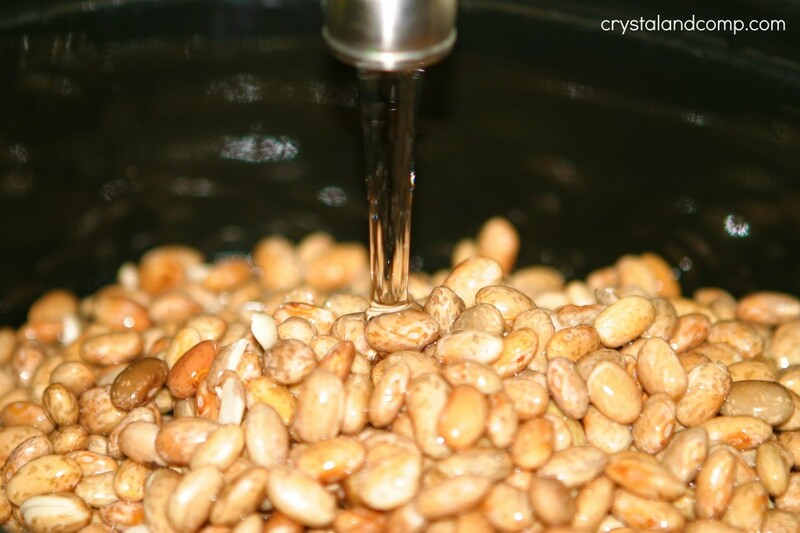 In a large bowl, cover your beans in water and soak them over night. Soaking them at room temperature is perfectly fine. The next morning dump the water and thoroughly rinse the beans. There will be a significant amount of dirt in the bottom of the bowl, it can be kind of yucky. Pick out any bad beans and any rocks. Yes, I’ve found rocks. Once rinsed and picked through, place them in the crockpot and cover in water. It is very important not to fill it up with water to the very top. Make sure your crockpot is only 3/4 of the way full, max. I buy salt pork in a 12 oz package. I open the package and chop it into four even sections. I only use one of those sections in a 2 lb pot of beans. Pop the other 9 oz in the freezer to use at a later time. Place 3 oz of the salt pork in the crockpot. 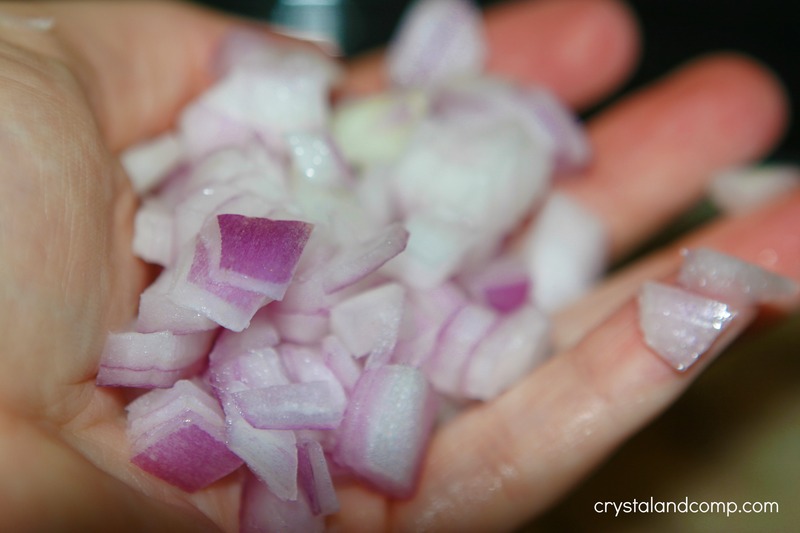 Chop up a small onion. I prefer purple onion in beans. Toss them in the crockpot. Less if you want, more if you want. 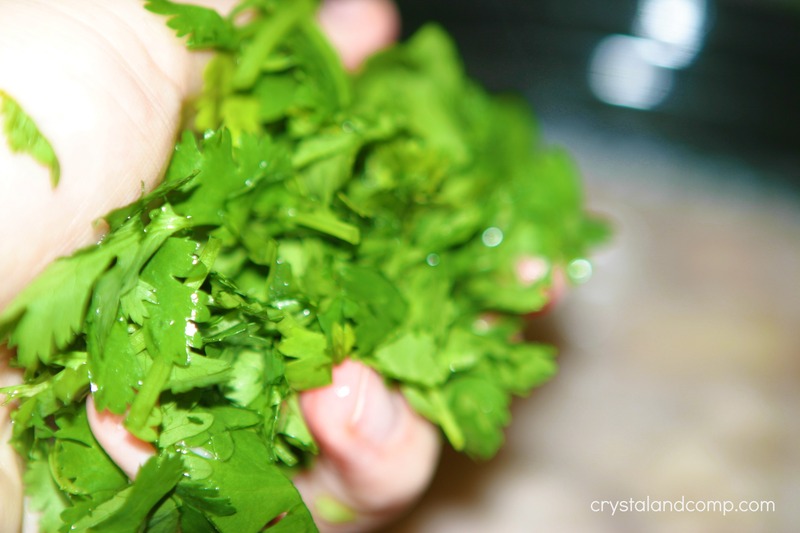 I love cilantro and I love the smell of it cooking. Toss in a can of Rotel, undrained. Measure out the cumin and toss it in. Add a couple of cracks of fresh pepper too. 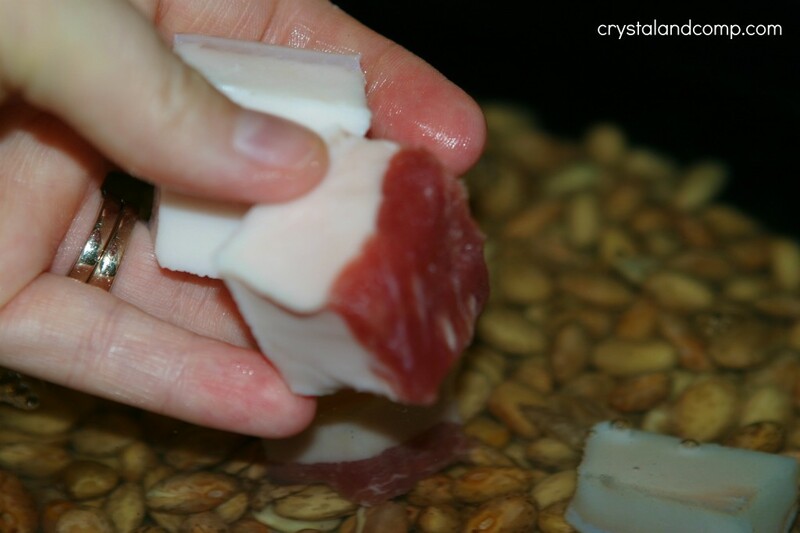 No salt is needed- that is the purpose of the salt pork. Cook on high, yes high, for 10-12 hours. Beans take a long time to cook and with your crockpot this full it will take even longer. If you want, after 10-12 hours on high, move them to low and let them even cook longer over night. Not a must, but makes the flavors even more amazing. 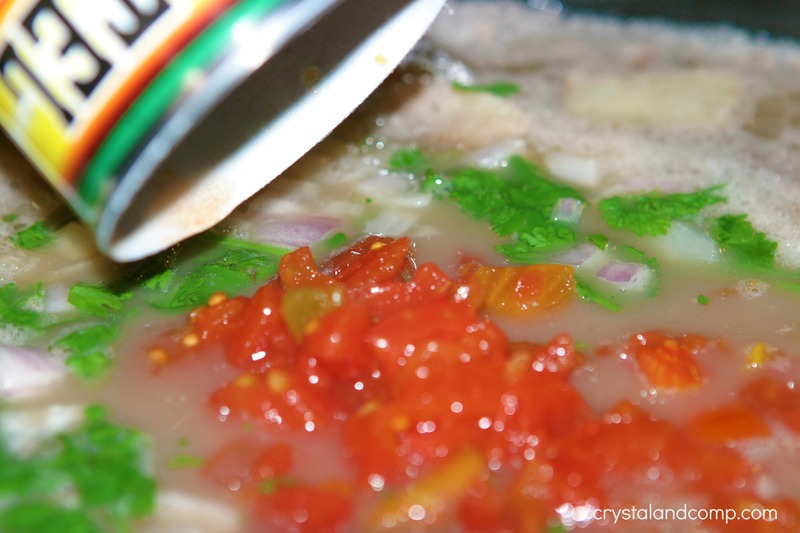 Once the beans are done, remove the salt pork. 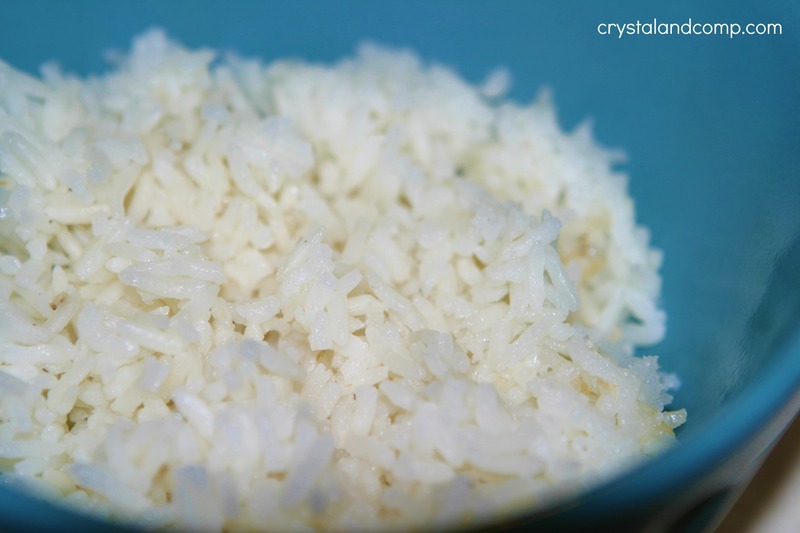 In a bowl, place about 1/4 of a cup of steamed rice. Pour a couple of scoops of beans on top of the rice. Top with cheese, sour cream, salsa, guacamole, etc. I like to stir it up a bit. Add some grilled cooked chicken or some diced steak and you have a homemade Chipotle bowl. 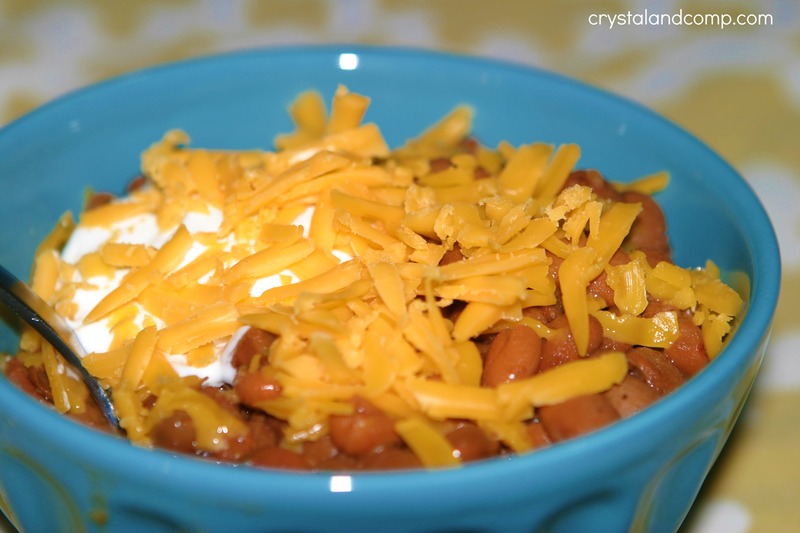 Freeze any leftover beans for burritos, nachos, tostados or taco soup. Heather- I need to make black beans in the crockpot and freeze them. Thanks for the suggestion! Yum! We actually have beans and rice about once every week or so. Inexpensive and filling, and we’ll even make homemade tortillas, which makes it extra special. Then with leftovers we’ve got lunch for the next day, too. Thanks for sharing your recipe, I’ll try them like this next time! Annie- beans are a thrifty solution, aren’t they? I’ve never heard of salt pork before. Where do I get that? Is it sold at regular grocery stores? Could I just use regular salt instead? How much would I use? Oh, I’m in Southern California in case it matters as far as finding salt pork. Salt pork is over by the bacon and ham. 12 oz is not as big as it sounds- it is a small square package. You could use ham or bacon instead, but more flavoring comes from the salt pork. I know beans are really frugal, and we’ve just never gotten into them. I remember my mom making baked beans and hot dogs, and loving them. My dh isn’t a big bean fan; maybe that’s why they’re not in my repertoire. Barb- if your dh is a meat eater it can be hard to eat rice and beans and think you’ve had a meal. I understand. 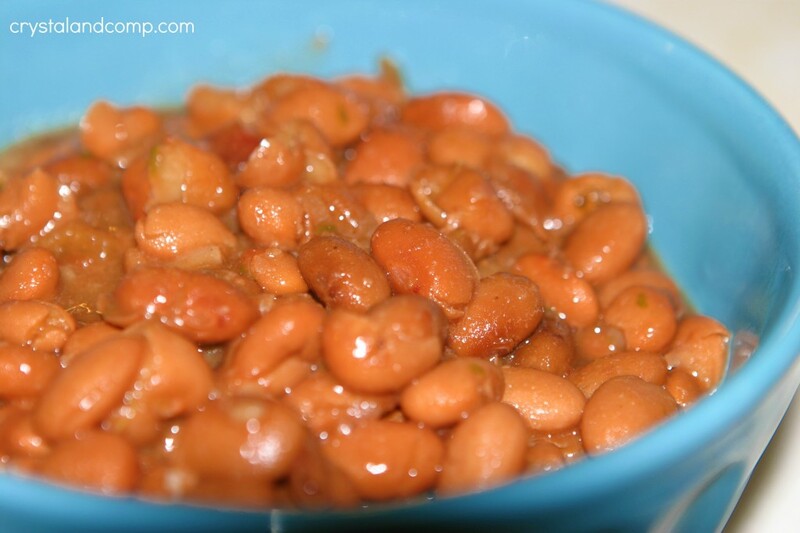 What I love about beans is that they are high in protein, inexpensive and very filling. Let me know if you give them a try. 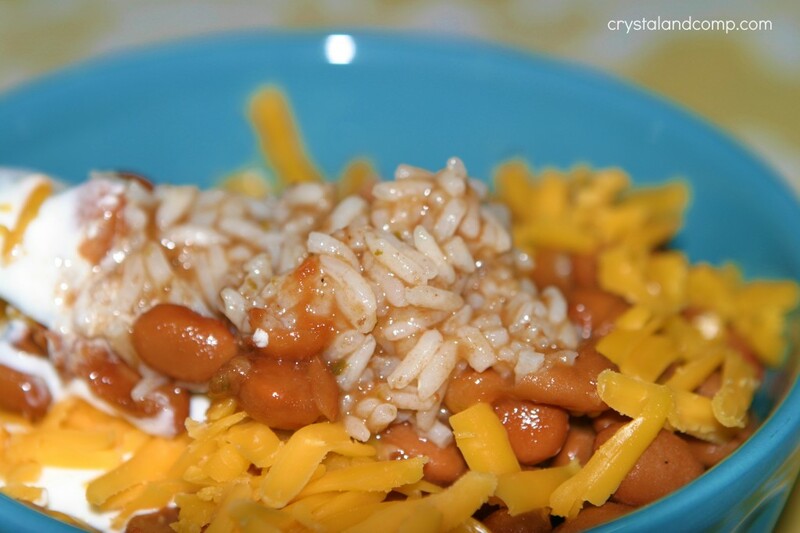 Crockpot beans minus the rice are great as a side too. I’ve never made beans from dried but this makes me want to since the quantity is so much more than I get from 2 cans or precooked. Melinda- and you can make a lot and freeze the leftovers so that you always have beans on hand. I grew up on dried beans, but I’ve gotten lazy. Thanks for a great recipe! Awesome, Jaime. Glad you like the recipe! What size of a crockpot? Size does matter for amount of water used. Thanks! I used my 6 qt to make 2 lbs of beans. And you’re right, size does matter for the amount of food. You do not want to fill the crock more than 3/4 of the way full or it will take days for the beans to cook. That might explain why it takes so long to cook and I thought I had done something wrong. Thank you so much! 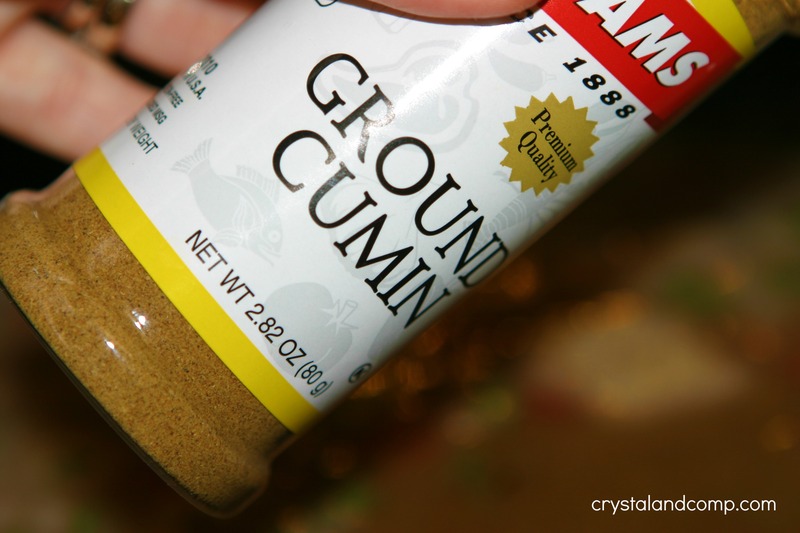 Gena- here are 10 tips you might find useful for cooking in the crockpot. Interesting, Amanda. I never knew that. Thank you for sharing Crystal! I always love a good cheap and easy dinner idea! Happy to hear it Kelsey. Inexpressive dinners that are still healthy are always great for meal planning. Do you cook black beans the same way you cook the pinto beans? Do you do anything special to freeze? What about to thaw? Nothing special. I just toss them in a ziplock bag or a plastic container. Leave some room for things to expanding during the freezing process. This seriously looks good. I would love to try this out! Suzie- this is such a great meal on a budget!